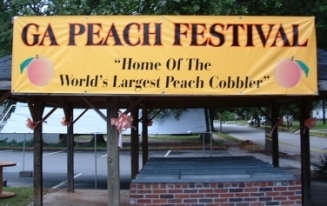 While most Peach County residents lie asleep in their beds on the final Saturday morning of the Peach Festival, Rich Bennett and his team of volunteer bakers will be wide awake and working on Peach County's renowned culinary masterpiece: The "World's Largest Peach Cobbler." And by 2 o'clock Saturday afternoon, a substantial crowd will have already begun to line up for a taste, an annual event many consider to be the most anticipated highlight of the Georgia Peach Festival. Check out this 11 Alive news report. Beginning with the festival's return in the 1980s, a county commissioner traditionally headed the task of baking the marvel. Several years ago, however, commissioners appointed Bennett, the county's information systems manager, to the celebrated job. "I had to go through a one-year apprenticeship first," Bennett said. "That shows how serious they are about it." He, members of his family, other county employees and various volunteers convene at 4 a.m. on the final Saturday of the Peach Festival in Fort Valley to begin their work on the yearly project, which takes roughly five hours to complete. For the next several hours, after the baking process ends, the cobbler will cool until it is ready to serve the masses. 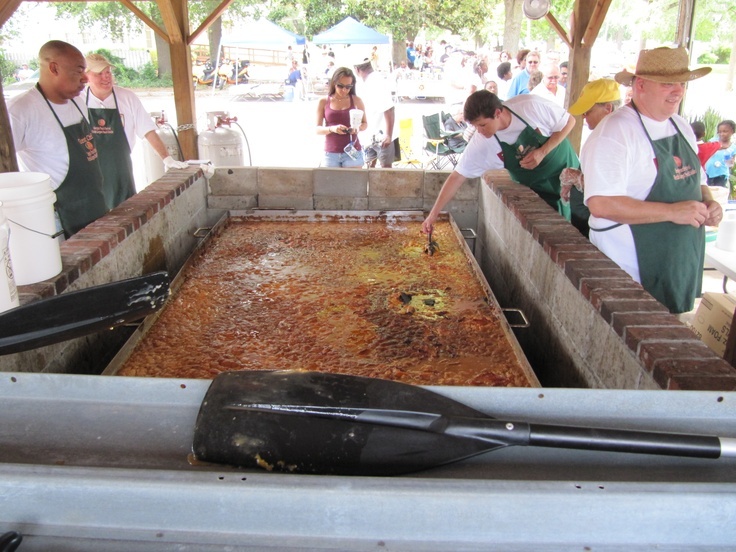 The colossal cobbler -- 11 by 5 feet and about eight inches deep -- is made from an extraordinary 90 pounds of butter, 150 pounds of sugar, 150 pounds of flour, 32 gallons of milk and, of course, 75 gallons of peaches courtesy of Lane Packing Co. The cobbler's other ingredients are purchased by sponsors. The giant cobbler is prepared in a brick oven constructed especially for the cobbler in the parking lot of the Peach County Courthouse. For a baking pan, the chefs utilize school bus floor panels donated by Blue Bird Corp.
Bennett said the arduous process begins with dividing the ingredients into five workstations manned by six to eight people. Everything is mixed in large plastic containers and stirred with boat paddles. Receiving attention from various news media, and even national television coverage, Bennett humbly admitted surprise at the acclaim the cobbler has received over the past few years. "I am amazed at how many people travel from all distances -- Florida, Pennsylvania -- just to see it," he said. "I even have people ask to take a picture with me when they come to eat it." Since taking on the job, Bennett has incorporated his own fresh techniques in preparing the giant pie. "We're always tinkering with the process, it's always evolving. We are constantly looking for ways to make the cobbler better." Bennett reminds festival-goers to bring their own containers into which they can pile as much cobbler as they can handle. Further proving its enormity, the festival has never run out of cobbler, despite the large number of enthusiastic gobbles. "I really enjoy this," said Bennett. "It's a lot of fun. What I like best is the amazement from people when they see how big it is. That makes it worth the labor we put into it." (This story adapted from an article by News Editor Brian Shreve published in The Leader-Tribune, Wednesday, June 20, 2007.